Today went a little bit off what was expected. Usually we go to a home-ed group meeting on a Monday, but this week sadly we couldn't afford the petrol cost to get there. So sad as I was really looking forward to meeting up with friends and trekking on Dartmoor, but it was not to be. Our bank balance is much lighter than usual as it hasn't yet recovered from the bashing it took at Christmas. We would have managed absolutely fine except husband had to take our bathroom and put it back in again as part of his NVQ assessment for college which cost us £90 for parts - eeek. So that was our "spare" money gone and this week we have to be really frugal with our pennies. 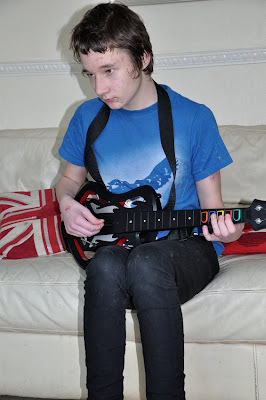 So, a day at home for us instead, with a college assessor joining us for part. Our morning started with a quick clear up and reading session. Chelsea finished reading her chapter book - Haunting Violet by Alyxandra Harvey. Don't you just love this style? 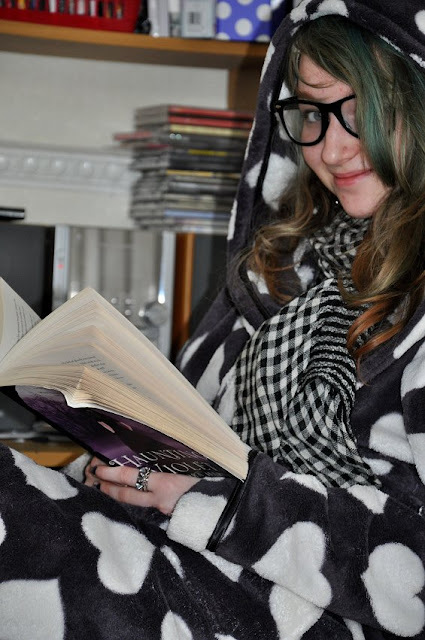 Fake glasses that she doesn't need, scarf and a dressing gown over clothes is the new look for 2012 dont'cha know. I won't share Chelsea's thoughts on the book on here as she is, as I type this, typing up a book review for her own blog over here: http://unschooledmusings.blogspot.com Chelsea would love to have more readers and followers if anyone fancies popping across to read what a 16 year old has to say. If she actually thinks people are interested in what she writes she may actually continue writing - I can hope. Tiegan is reading Best Friends by Jacqueline Wilson. She does love reading so much, I often look over across the room to see her with head buried in a book. Tiegan also really enjoys reading out loud to me too, which she did yesterday whilst I tried to get to grips with crocheting. 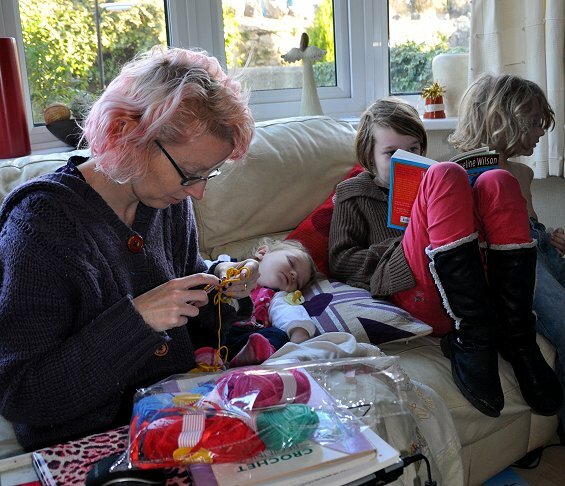 Please note, I didn't knock Taisia out as it looks like I did in that picture, I wasn't that desperate to crochet. I did however, master the single crochet stitch. You can just tell how chuffed I am huh? That saying simple things please simple minds has never been so true. We went for a lovely walk around the village, watched birds flying and tried to identify leaves and trees. Taisia is loving her ability to stroll around with us, although it does turn a 20 minute jaunt into something nearer an hour. I bought a second hand different version of the game from Gamestation which has a Bon Jovi song on it (just for me) - you can imagine the rockin' that goes on to that one! Happy faces as always. How's Chelsea getting on with her college course in beauty and hairdressing? Ah, the benefits of a napping baby... Pip now three years old occasionally naps but for the most part is in amongst the chaos and causing chaos!! I like the dressing gown over clothes look - plus it keeps you nice and warm at this time of year!